Fresh Scent Concentrate - Formulated in a broad spectrum of fragrances. These deodorizers effectively eliminate unpleasant odors. Use against restroom odors, animal odors, cooking odors, smoke and tobacco odors. 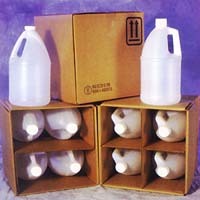 Use in solution to freshen vacuum bags, garbage bins, carpet and upholstery. Use your favorite fragrance during carpet cleaning by adding 2-4 oz. in the solution tank. Or applying using a sprayer. Can also be used as la light all-purpose neutral cleaner. Works great with steam type carpet cleaners, mopping & cleaning, laundry, shampooing, room spraying and as an air refresher in all air conditioners. Or... use during carpet cleaning by adding 2-4 oz. in the solution tank. You can also apply using a sprayer. Can also be used as a light all-purpose neutral cleaner.